Emma Guthrie was born March 26, 1918 in Chapel Hill, NC to the late Will and Etta Guthrie. She was the only girl and had three brothers: Roosevelt, Odell and Herman. Emma was an avid reader and she encouraged everyone to read. She had to quit school in the 11th grade to help support the family due to her father’s untimely death and her mother’s poor health. 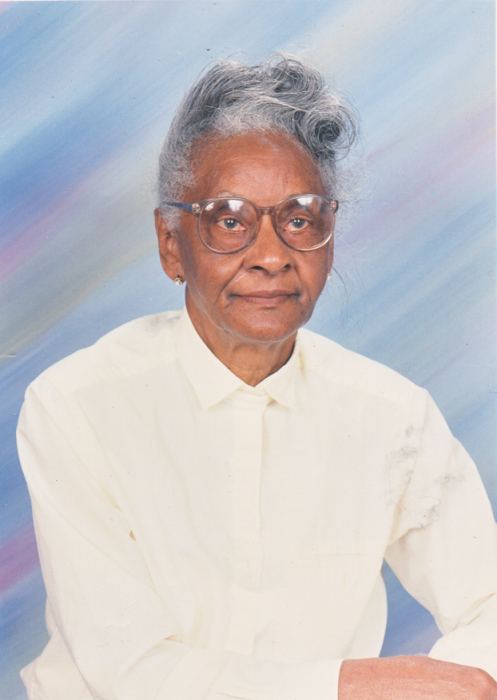 She was married for 42 years to Cewell Wood, Sr. and they were blessed with three children: Mary D. Latta – Deceased (Hoover); Cewell Wood, Jr. (Selma) and daughter Alexis. She is survived by a host of relatives, friends and family including: 11 grandchildren; 22 great grandchildren; 13 great, great grandchildren and 1 great, great, great grandchild. She worked 20 years at the Lyman restaurant before retiring to take care of her husband before his passing. Emma was a member of Wesley Chapel United Methodist Church. She was a true servant and she loved her church and community. Some of her acts of service included: being a strong supporter of the Needmore Community; an advocate, advisor and mentor to the youth and seniors in the community; an Usher at Wesley Chapel United Methodist church; a Sunday School Teacher; a member of the United Methodist Women; a member of the Golden Girls Widow Club; a soup kitchen volunteer at Greer Soup Kitchen; a church secretary, a chaperone for Phyllis Wheatley Drug Prevention Program and an advocate for the City Council. Emma was a witty conversationalist who loved to laugh. She’s read hundreds of books and written in many personal prayer journals. She could give you a prayer and scripture for any problem you were having. One of her favorite sayings was: “Good. Better. Best. Never let it rest ‘til your good is better and your better is best.” St. Jerome. Funeral Services will be held 11:00 AM, Thursday, June 14, 2018 in Wesley Chapel United Methodist Church with Rev. Dr. Christopher Thompson, Presiding and Rev. Alfred Wright, Officiating. Burial will follow in the church cemetery. In lieu of flowers, you may make donations to the Wesley Chapel United Methodist Church Building Fund.